Elizabeth Warren Says, "Get Rid of the Electoral College"
Sen. Elizabeth Warren speaks during a New Hampshire organizing event for her 2020 presidential exploratory committee at Manchester Community College on January 12, 2019, in Manchester, New Hampshire. During a CNN town hall Monday night in Mississippi — where GOP laws and suppression tactics have disproportionately harmed black voters — Sen. Elizabeth Warren (D-Mass.) said the best way to strengthen voting rights nationwide is to amend the U.S. Constitution and abolish the Electoral College. 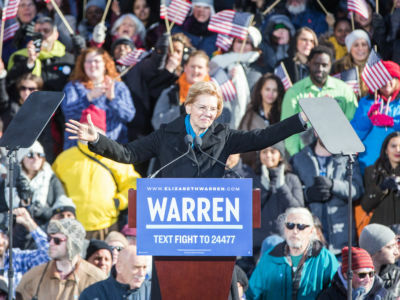 “Every Democrat running for president in 2020 should be standing alongside Elizabeth Warren in calling to eliminate the Electoral College so the popular vote determines the next president — and pass a constitutional amendment to guarantee the right of every American to vote,” the Progressive Change Campaign Committee (PCCC), which is backing Warren in the Democratic presidential primary, said in an email to supporters. “When you’ve got a government that works for the rich and it’s not working nearly as well for anyone else, that’s corruption, and we need to call it out plain and simple,” the Massachusetts senator said, pointing to her sweeping anti-corruption legislation that would — among other major reforms — bar members of Congress from receiving donations from lobbyists and completely ban foreign lobbying. Warren went on to highlight America’s soaring wealth and income inequality and call for a total rewrite of the nation’s economic rules. “Part of that is putting more power back in the hands of workers,” Warren said. The senator said imposing higher taxes on the richest Americans is another essential and way to curb inequality and fund major items on the progressive agenda. Can Warren win over Democratic voters with the language of regulation, rather than revolution? In their recent article, the HuffPost willfully ignores the opinions of Native writers.